Henry Brown emerging from 27 hours in a small box. It was a miracle he survived. This is an extraordinary story. 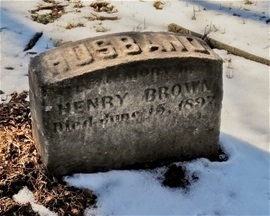 Against all odds, Henry Brown triumphed not once, but twice. 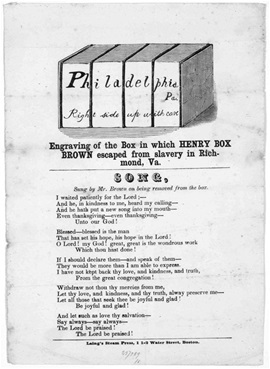 Henry Box Brown (1816-c.1889) was a Virginia slave who escaped to freedom by arranging to have himself shipped to Philadelphia abolitionists in a wooden box. The box was 2’8” wide, 2’ deep and 3’ long. The harrowing journey took 27 hours. The box traveled by train, steamboat and horse and cart. For part of the journey, the box was set upside down with Brown on his head. The book was published in 1849. News of his daring and ingenious escape traveled fast. Soon he began appearing at public antislavery events. 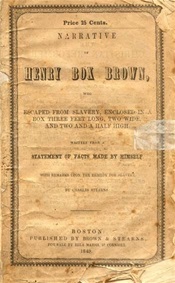 He also participated in the publication of a book about his life, you can read the whole book at this link, Narrative of Henry Box Brown, Who Escaped from Slavery, Enclosed in a Box Three Feet Long and Two Wide and Two and a Half Wide. Moving panoramas were at the height of their popularity in the mid 19th Century. They were most popular in the US and England. 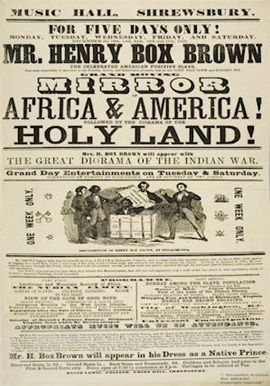 Brown used the proceeds from his lecturing and book to produce a moving panorama entitled “Henry Box Brown’s Mirror of Slavery.” It was one of the first moving panoramas on the topic of slavery. 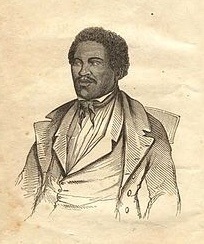 Brown presented it in the northeastern United States from April until August 1850, when the debate and passage of the Fugitive Slave Law of 1850 came to endanger his freedom. The risk of recapture brought an end to his performing in the U.S. This article advertises one of his shows in England, where he lived for 25 years. Image courtesy of Russell Potter. Thank you! This wonderful newspaper clipping from 1859 outlines Part I and Part II of the moving panorama show - The Grand Original Panorama of African and American Slavery. Image from Education @ The Library of Virginia. This sheet contains the words to the song that he sang when he emerged from the box. He later made the song a part of his performance when he reenacted the story. Read more about it at Education @ The Virginia Library. Photo by Brian Mackie, used with permission. Thank you. When I first created this webpage in 2014, his grave had not been discovered. Since then I have learned that he died in Toronto on June 15, 1897. He is buried in the Necropolis Cemetery, Toronto Municipality, Ontario, Canada. The Necropolis is in the Cabbagetown neighbourhood of Toronto, just east of downtown. It was one of the poorer areas of the city 125 years ago. 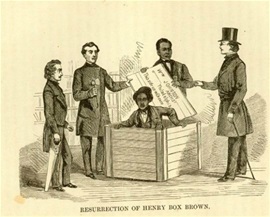 The Unboxing of Henry Brown, by Jeffery Ruggles. 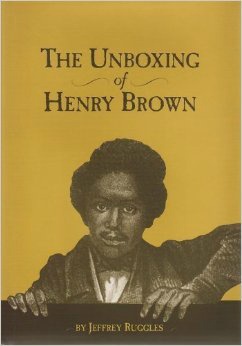 Ruggles, Jeffrey, The Unboxing of Henry Brown , Library of Virginia, Richmond,Virginia, 2003. The book, The Unboxing of Henry Brown, by Jeffrey Ruggles, not only talks about Brown’s early life and escape to freedom, it gives a rare glimpse into the life of a 19th Century moving panorama showman. Much of the book focuses on Brown's moving panorama. He spent ten years researching the book, making several trips to England uncovering some never before published information. Brown's moving panorama did not survive, but by piecing together bits of information from newspaper reviews, handbills and from a book of that time, The Nubian Slave, Ruggles was able to speculate on what the moving panorama looked like and how it was created. My favorite parts of the book talk about what it was like to be a moving panorama showman in those days. It was hard work transporting the cranking apparatus and scroll by train and horse and cart. Protecting the delicate scroll from the weather, finding places to perform, procuring letters of endorsement and dealing with racism were just a few of the challenges Brown faced. The Virginia Shop is part of the Library of Virginia. To purchase the book, contact The Virginia Shop, Part of the Library of Virginia at the link below, where the cost of the book is $25.00. If you search for the book via other on-line purchasing resources, you will find the price to be between $100.00 - $200.00, so go to The Virginia Shop site! In 2016, I made a crankie as a tribute to Henry Box Brown. It was displayed at the Banners & Cranks exhibit at the Ballard Instutute, Univ. of CT in 2017. 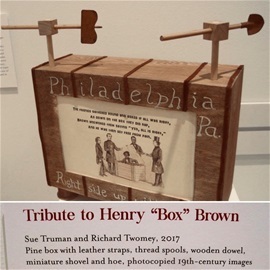 The idea for the shovel and hoe cranks came from the chorus of the song: "Brown laid down the shovel and the hoe, Down in the box he did go, No more slave work for Henry Box Brown, In the box by EXPRESS he did go."